The Dolphins reportedly believe Florida State CB Xavier Rhodes would be a poor fit for their defensive scheme. Rhodes was a popular early mock draft pick for the Fins at No. 12, but he is a press-man corner and Miami runs zone. If the Dolphins sit tight at 12 -- which seems like a long shot anyway -- they'd be more likely to consider West Virginia's Tavon Austin, Notre Dame's Tyler Eifert, or even pass-rush help than Rhodes. Yep, one of the big knocks on Rhodes is his poor awareness, which could really expose him if he's asked to play a lot of zone. I think Banks, Trufant, and Amerson are three corners with more experience in zone schemes that would fit what we're trying to do. Personally, I like Banks in the 2nd, and Amerson in the 3rd. Be careful gentlemen, as we are full blown into the lying season. 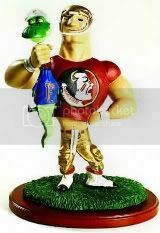 I am very familiar with FSU since I am a big fan of the Noles. Yes, they played bump and run coverage, but they also played zone under Mark Stoopes. Is Xavier a better press cornerback right now, yes, but with his athleticism and ability, there no way this kid can't be a better zone CB. I will say this though, as I think trade down is a very valid option. If this happens, the CB to look out for is indeed D.J Hayden or Jamar Taylor in my opinion. And as far a fewer mock draft showing Rhodes to Miami, all you need to do is look at NFL Network, as every guy on that board has Rhodes to Miami. Miami could go in a variety of directions, CB, DE, WR. That said, especially this time of the year, you have to be careful of what is the truth and what is a so called smokescreen. I just think Rhodes is more likely to get picked in the last few picks of round 1 or the top of round 2. Too many good corners in this draft and others are rising. Milliner, Hayden and Trufant are gonna go top 20. After that maybe 1 or 2 more go round 1. But it could be Taylor and Wreh-Wilson instead of Rhodes. Rhodes has the stiff hips that everyone has reported on. His best hopes are Denver, New England and Atlanta as far as being a 1st round pick. I can't begin to tell you how much I disagree with your statement. I will leave it at that and not comment on this post any further. There are a lot of good corners in this draft, but there is no way that so many corners get taken before Rhodes. Yes, we all saw the stiff hips that he had at the combine, and yes, his awareness may be suspect and yes, he may not fit will in our zone coverage. But the truth of the matter is that he is, depending on who you listen to, the second or third rank CB in this draft behind only Milliner and perhaps Trufant. Hayden is a good talent, but his medical issues are going to push him behind Rhodes. Taylor and Blidi aren't the talents that Rhodes is. Taylor is skyrocketing up people's draft boards right now and is likely to be a late first round pick, but he's not going ahead of Rhodes. Blidi is still a second round guy in my opinion. I would put Darius Slay and Johnathon Banks ahead of Blidi right now, and neither one of them is going to be taken ahead of Rhodes either. You also have to recognize that most of these experts rank the corners, and simply slot them in based on needs. They don't care whether Rhodes, or Trufant, or Banks, etc are the better fit for our system. They just have Rhodes as there #2 corner and he happens to be on the board when the Dolphins pick. Also, that pick is based on the popular belief that all three offensive tackles are already off the board. On the Dolphins board at least. Rhodes will have a future in the NFL, but not on a team that plays zone.